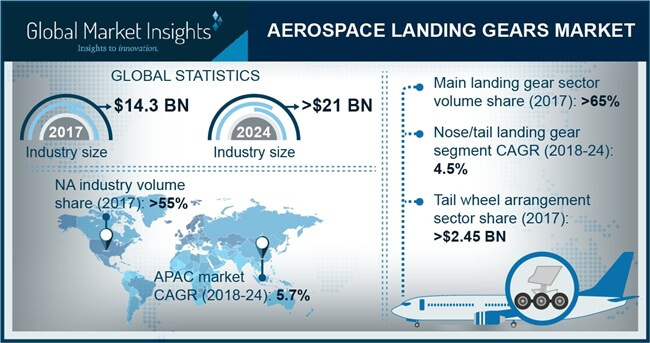 Aerospace Landing Gear Market size is estimated to surpass USD 21 billion by 2024; according to a new research report by Global Market Insights, Inc. The increasing aircrafts demand owing to proliferating tourism sector along with increasing air passenger traffic and cargo will drive the aerospace landing gear market size over the forecast timeframe. Increasing customer spending along with increasing preference for air travel owing to lower travel duration and superior safety will further expand the business share till 2024. Improvement in aviation sector, airport infrastructure, and consistent commercial aircrafts demand owing to decreasing air ticket prices will fuel the product demand over the projected timeframe. Increasing population and improving living standards mostly from the emerging countries are providing a positive outlook for the industry from 2018 to 2024. Global aerospace landing gear market from tri-cycle arrangement accounted for 12,221 units in 2017 and is expected to continue its dominance till 2024 owing to several benefits offered including prevention of nose over while braking at higher landing speeds, enhanced visibility from flight deck, easier maneuvering & landing, and prevention of aircraft ground looping. The reduced weight of the system along with lower drag compared to its counterparts further strengthens the volume share till 2024. Rotary wing segment will grow significantly at around 6.8% CAGR from 2018 to 2024. This can be credited to the benefits offered including vertical take-off and landing operations, travel in any direction, and travel to areas with space constraints. Increasing adoption of helicopters for military applications including combat and non-combat operations further supports the segment growth. The adoption of fixed wheels and retractable landing gears depending on the weight of the helicopters will provide a positive outlook for the aerospace landing gear market growth. Industry participants are continuously investing in R&D for developing efficient and modernized aircraft systems for increasing the overall aircraft life and minimize the risk of accidents and service failures. The usage of light weight materials for the construction of aircraft components and landing gears are further strengthening the aerospace landing gear market till 2024. The high costs associated with the MRO along the complex design and development processes required for the manufacturing of reliable and light weight gears may hamper the business growth over the study timeframe. However, with the increased adoption of smart repairing techniques with the usage of structural health monitoring operation, RFID tags, and wireless sensor networks, will reduce the MRO costs significantly. Main landing gear will account for the maximum volume share of over 65% till 2024. This dominance is attributed to the usage of such gear for handling most of the aircraft weight. It include several components including anti-skid braking systems for enhancing the braking performance of the aircrafts during landing operations. The usage of light weight materials for reducing the gear weight will further boost the aerospace landing gear revenue generation till 2024. Global aerospace landing gear market from commercial aviation was valued at over USD 12 billion in 2017 and is projected to continue its dominance over the study timeframe. This is attributed to the introduction of wide-body aircrafts with enhanced passenger seating capacity up to 500 passengers for long distance travel. Increasing transportation of cargo and proliferation of the commercial air freight are boosting the revenue generation till 2024. OEM segment accounted for over 65% of revenue share in 2017. Increasing investments from industry players for adopting innovative technologies for reducing design and development cycle and cost will drive the segment demand. The requirement to comply to stringent regulations for making flights airworthy along with reducing the weight of the systems and increasing efficiency will showcase significant growth prospects to the aerospace landing gear industry. The prominent players in the aerospace landing gear marketplace include Safran Landing Systems, AAR Corporation, GKN Aerospace Services, Liebherr Group, Triumph Group, and Eaton Corporation. Other notable players include Magellan Aerospace Corporation, Heroux-Devtek Inc, SPP Canada Aircraft, Whippany Actuation Systems, CIRCOR Aerospace UTC Aerospace Systems, and Aerospace Turbine Rotables. Industry participants are involved in partnerships and long-term contracts with aircrafts manufacturers and fleet owners for strengthening their market foothold. For instance, in 2017, Heroux-Devtek signed an agreement with Hanwha Corporation for developing landing gear systems for the KF-X fighter aircrafts.